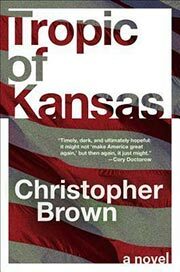 Brown, Christopher. Tropic of Kansas . Harper Voyager 2017. What if: The American embassy hostages in Tehran were executed, and a year later Ronald Reagan was assassinated, leading to Alexander Haig's taking over the government. Summary: Set in approximately the current time of a dystopian, near fascist America experiencing rebellion and ecological disaster. Published: Harper Voyager 2017 (0062563815BUY).